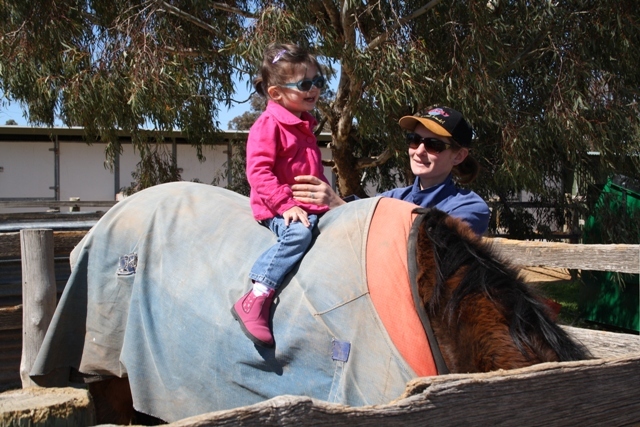 The other Sunday we decided to go visit Uncle Sean and Aunty Kym at the Equestrian Centre they manage. It was a beautiful day, blue skies as far as we could see and finally it was getting warmer after our cold winter. 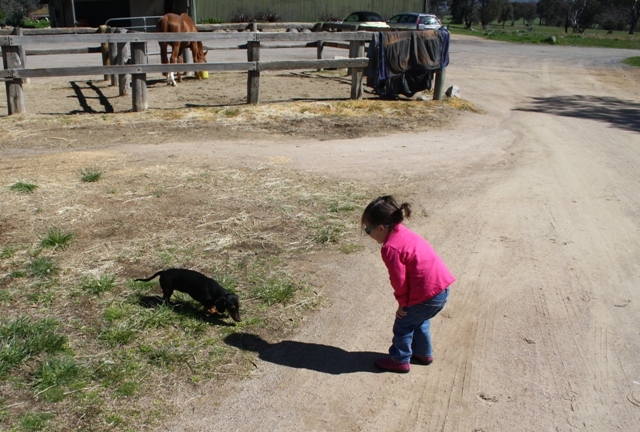 Anabelle LOVES it at the horses, all that room to run and play, dogs and cats and of course horses! Anabelle’s not too keen yet to sit on one (although she did sit on one just before we went home) she loves to feed them and chat to them. 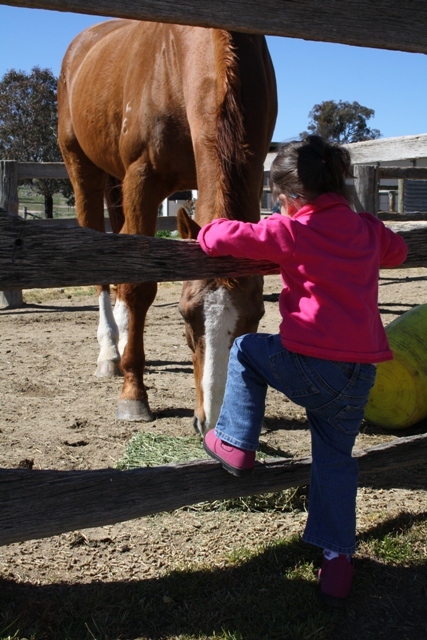 You can hear her saying “hi horsey” as she walks past – so cute! 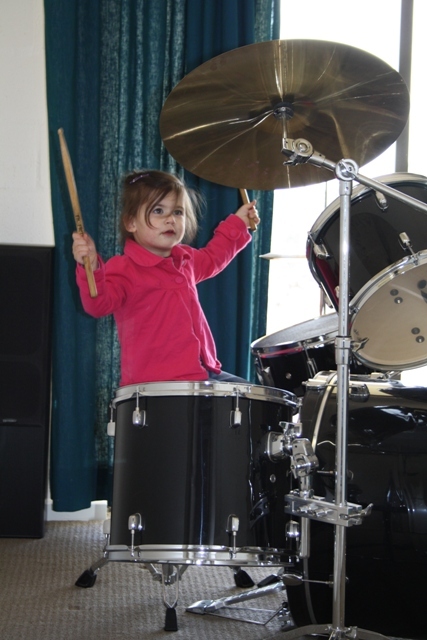 Uncle Sean has a music room down at the house where he has his drum kit set up. This made me happy because my kit is packed away in the garage and its been a long time since I’ve had opportunity to play so I jumped right on and bashed out some tunes. 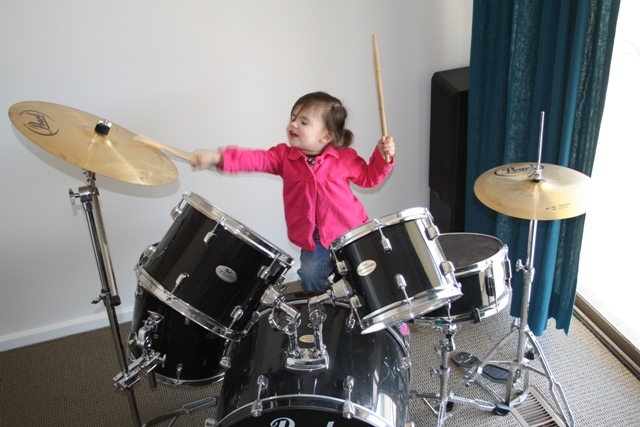 Anabelle’s face lit up when she saw me playing and asked “me too?” – how could I resist that! 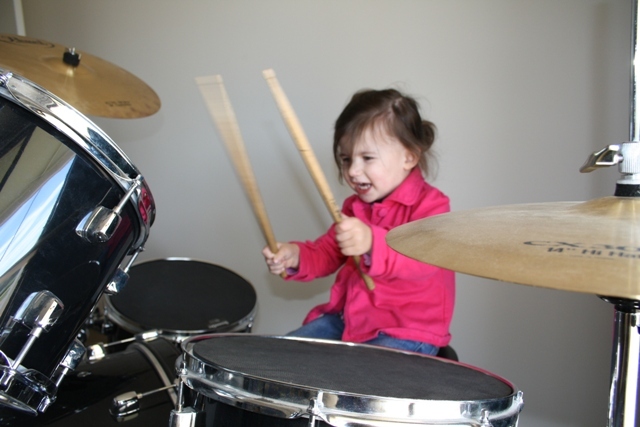 So I showed her – once – how to do a simple fill and drum roll and then let her loose. To my amazement she immediately began to copy me perfectly and then went nuts having a ball, she’s a natural!! 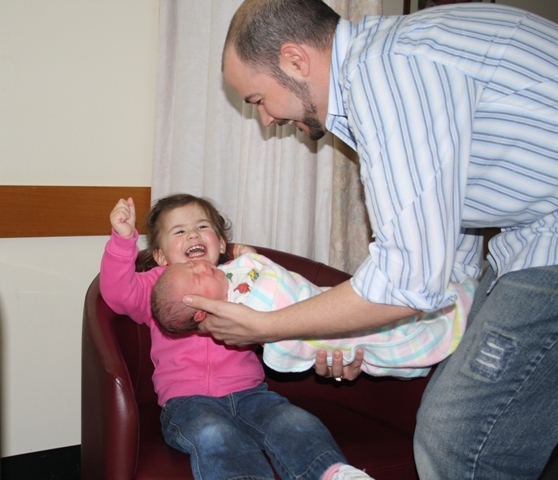 Our newly made family of four is adjusting well to having a newborn in the house again. Sleep is still a rare and valuable commodity, we’re attempting to grab a few Zzzz’s whenever we get the chance. 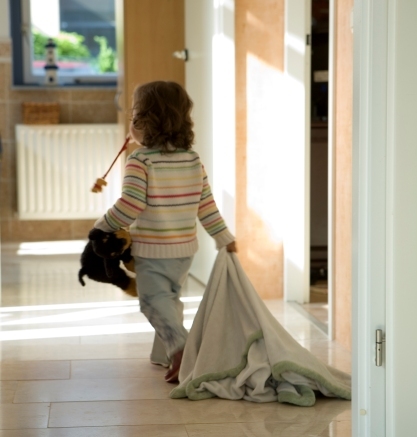 We’ve seemed to have found a good routine now balancing the needs of all our family members. We’ve all been to Playgroup twice now and Anabelle’s loving her weekly gymnastics class. We’ve even ventured out to the shops on a few occasions and both children have been amazing! As expected we’ve had the camera on constant standby and have captured some really great memories! 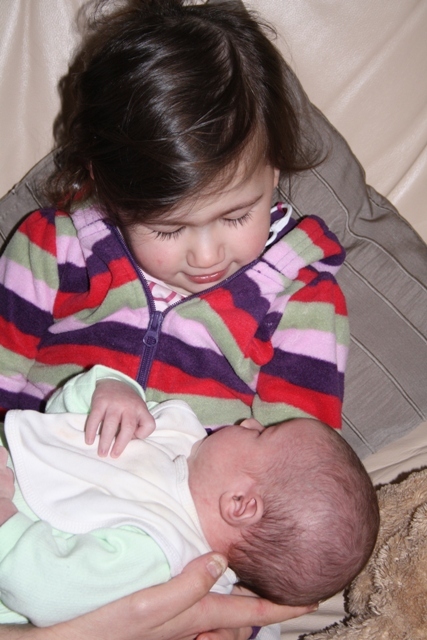 We’re amazed at how much Anabelle has taken to Levi, she’s always ready with a kiss and a hug and asks if she can “have a hold” and for a two-year old is surprisingly gentle. She regularly walks around the house calling for “E-bi” (she has trouble with the L and the V – so cute! :)) and giggles with delight anytime she gets to touch him and he reacts with a little squeak or by moving his arms or legs. 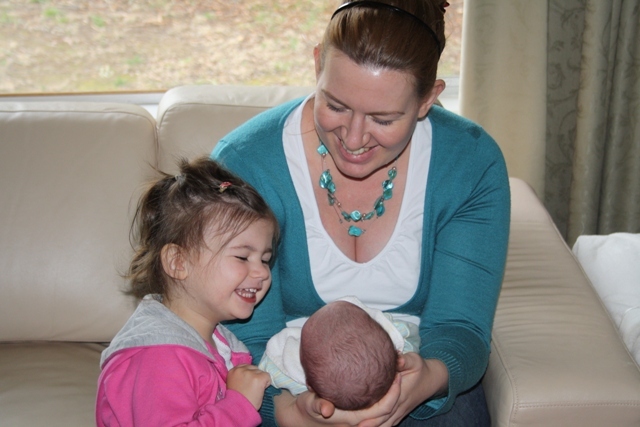 As with Anabelle, I can’t remember life now without two children. It’s a beautiful place to be and I’m so grateful for the time I’ve got off work – still another three weeks to go! Levi had his first real bath yesterday and seemed to love the water. 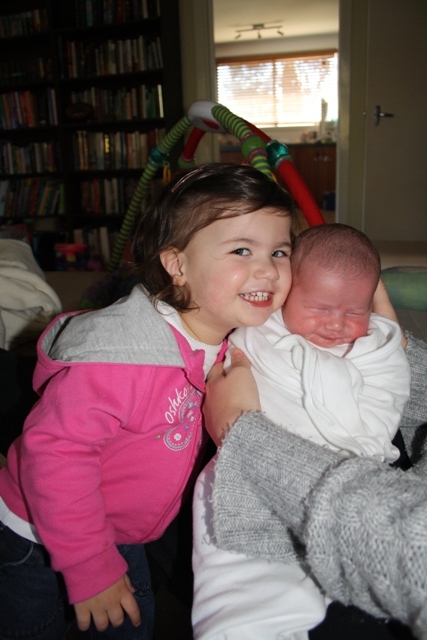 He’s so different to his big sister, her first bath was a scream-fest she didn’t appreciate it at all! We had a visit from the MAC nurse last Friday to check that everything was going well post hospital. Levi is an eating machine!! 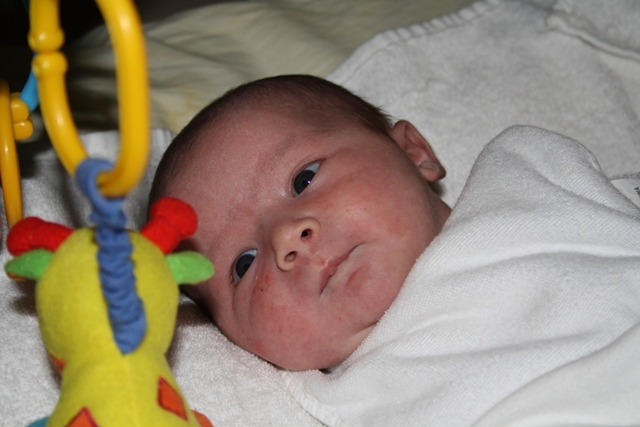 In the five days since he’s been home he’s back to his birth weight and grown 3.5cm – he’s doing so well. 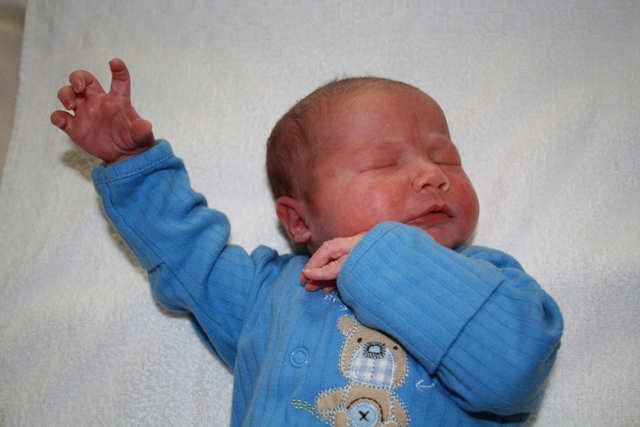 Thanks again for all your love and kind wishes, we really do appreciate them and we look forward to seeing you soon! At the moment I’m feeling like I’m on a 24/7 Youth Camp – tons of things to do and very little sleep ;). It’s all good though, before I know it these days will be long gone and we’ll be wondering what happened to our “little boy”. 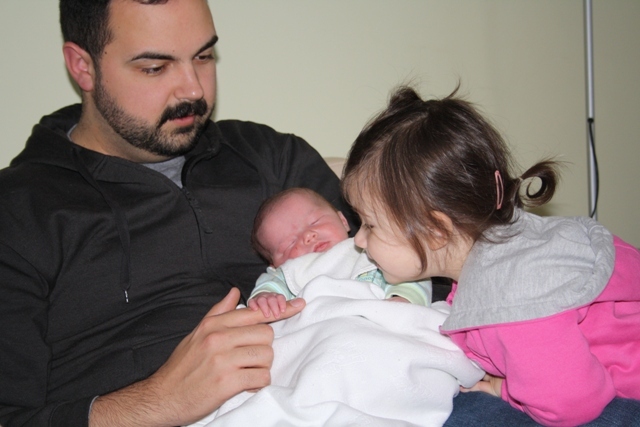 Anabelle has taken to Levi right away and really enjoys looking, touching and telling him everything will be ok when he’s crying, it’s so beautiful to watch. Thanks for all the love, support and well wishes, our family greatly appreciates it! 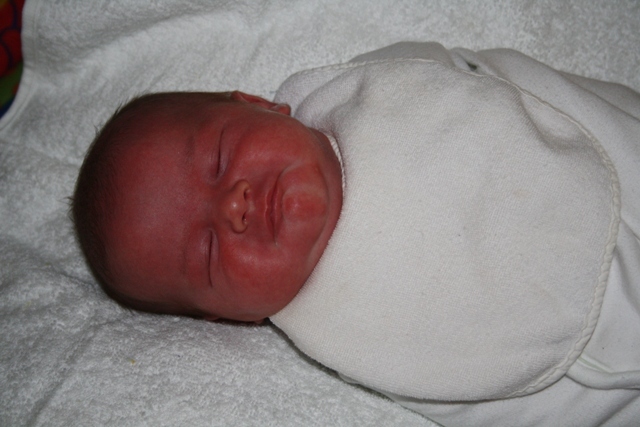 At 8:30am, Monday 2 August 2010 Sam, Anabelle and I were blessed with the safe arrival of our son, Levi Quinn! 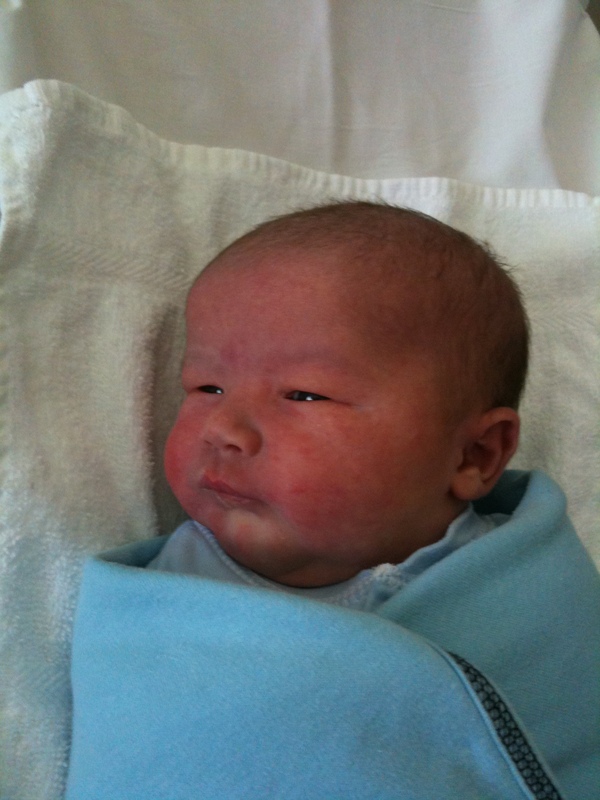 He was 4.18kgs (9.2 lbs) and 50cm long. 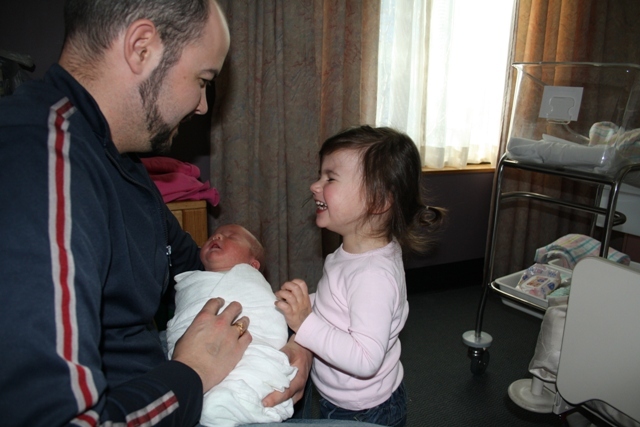 That makes him slightly smaller than Anabelle, which was a surprise because Sam was really big and everyone, including our doctors, thought he was going to be a big one. Anabelle did however spend an extra two weeks “cooking” so Levi had the potential to be bigger than her but not the opportunity I guess. Either way what’s important is that he’s finally here!! 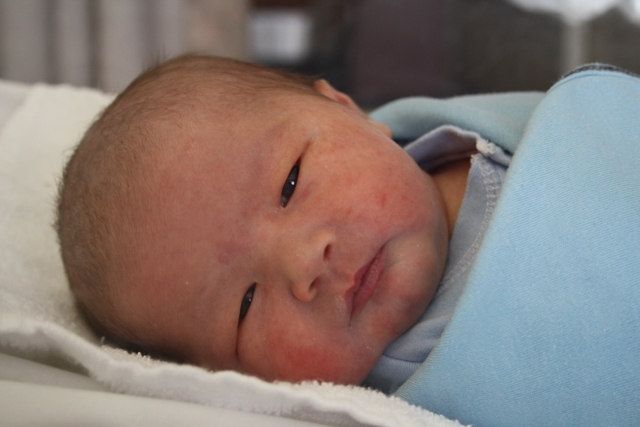 Sam and Levi are doing well after a planned caesarean birth, which after the 10 hours of labor and emergency caesarean with Anabelle seemed like such a relaxed birth. 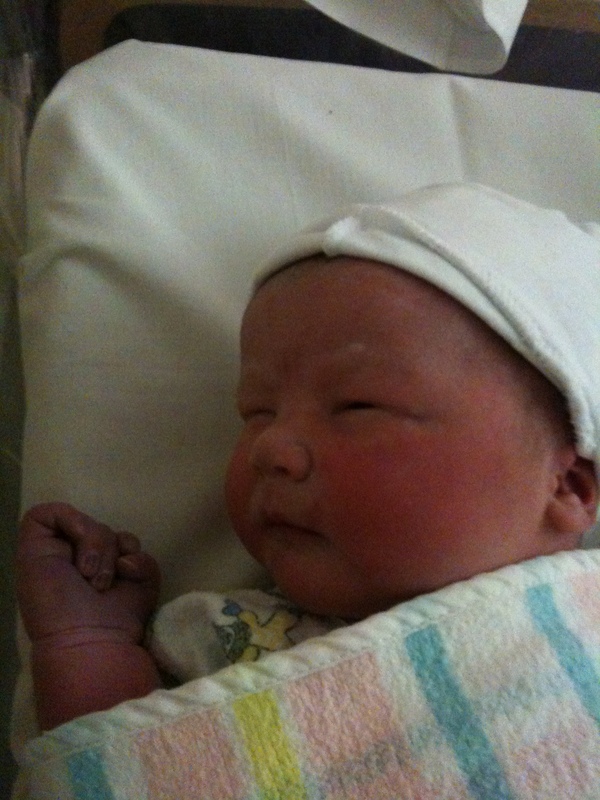 Sam is recovering well from the surgery and Levi is sleeping and feeding really well. 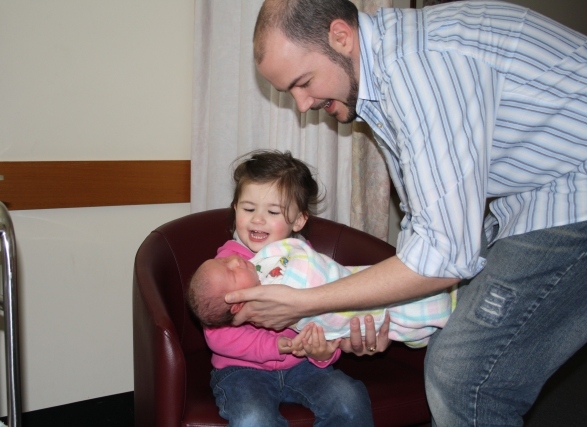 Anabelle loves him dearly, she spent many moments tapping Sam’s tummy saying “hello baby brother” and her reaction to finally seeing him “on the outside” was priceless. Anabelle climbed up on the bed next to his crib, leant over and said “c’mon, wake up!” “let’s play!” She then proceeded to tap him and say “good boy”. I think these two are going to be as thick as thieves and certainly give Sam and I a run for our money – totally awesome!! I think Levi looks a lot like my late grandfather, he certainly has his head shape and just quietly I’m really loving that I see Grandpa in him. If Levi grows up to be half the man my grandfather was he’ll be one amazing man! The family will come home together on Saturday and from tonight (Thursday) I’ll be at home after staying at the hospital. Anabelle and I are having some daddy-daughter time and it’s great! So enough from me, here are some photos from one proud dad! 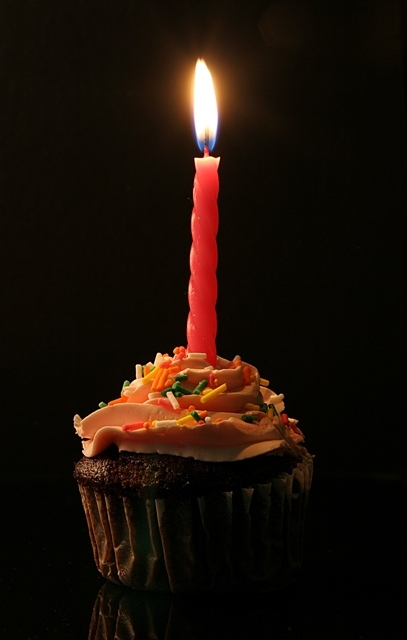 Each year around my birthday I like to take some time to reflect on the previous year, to remind myself of what’s happened in my life, to look at what I’ve learnt, achieved, failed at and where I’ve grown, learned new things and improved. The last twelve months have been full of ups and downs – I’ve certainly learnt a lot about myself, my character and who I want to be and what I’ d like to be known for. I think the biggest insight over the last twelve months has been a redefining of who I want to be as a man, husband, father and follower of God. My life has been twisted, shaped, honed and reworked this last year; it’s been painful in places and joyful in others. Life is all about growth, we’re either moving forward or going backwards – there’s no standing still. 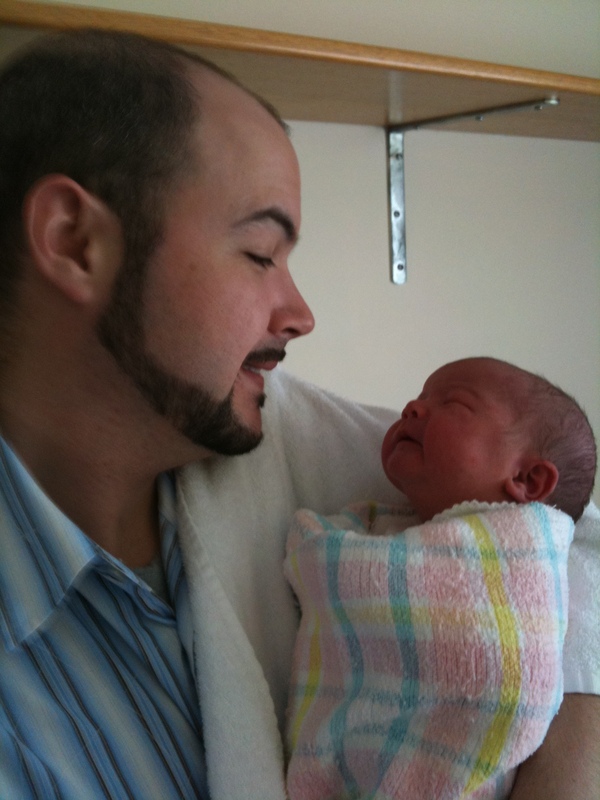 preparing to be a father for the second time – its really soon now August 2nd! realising how little I know about life and that my greatest advances in knowledge always come as a result of my failures. Ironic but I love how it works! That I need to watch what I say because my 2 year old picks up everything! Truly understanding Romans 8:28 in a fresh light “And we know that in all things God works for the good of those who love him, who have been called according to his purpose.” Life hasn’t been peachy – far from it but in all the ups and downs, God is constant and I can see Him leading me and shaping my life through the good and the bad – Amazing! One of the highlights of my birthday was a card I got from my brother Dan. Growing up as kids we were never into the same things but as we’ve become adults the bond between us has gone from strength to strength and I love him dearly. Do you make regular time to look back over the past year and learn from it? What have you learnt about yourself in the past year? The last few weeks have been a real challenge for our family. Time has passed as we have been in a haze fuelled by worry, concern, stress and a lack of sleep. It’s uncanny how when the proverbial hits the fan our first instinct is to circle the wagons and take matters into our own hands… a far cry from the creed we profess that God is our provider, that we trust Him in all things and wait on Him to deliver us. Makes me feel guilty and ashamed that I’m all too ready to take matters that I have entrusted to God back into my own hands. It’s been over a month since my last post – in that time we have come to the brink in our finances and suffered a week of, frankly worrying, health issues. Couple that with being first time parents, learning to manage on one income and preparing for the birth of our second child, it’s been a difficult road. The time has come to reassess our circumstance, to look at what we do, have and want to do, and make changes. We’re not adverse to this process; in fact it’s one I believe is necessary for a productive and purposeful life. My concern is that it’s all too easy for us to wait for a crisis to force us to change, rather than making evaluation and assessment an ongoing process in our lives. Sometimes circumstances are unavoidable; other times we have the opportunity to head them off if we’re prepared for them. Preparation is hard work, slipping into the comfort of routine is easy although often not beneficial. This last week we reached our breaking point, we could do nothing but surrender our lives and circumstances (again) to God. We realised (again) that we had slipped back into our old, comfortable way of life, following our own paths and intentions and neglecting to seek God for His. This last month has been a wake up call from God – retrospect is a great teacher, as I now look back I can see the subtle signs of a patient and loving God trying to set us back on course. As it often happens, it took a crisis for us to get back on track with God – oh how I wish we had of noticed sooner, yet I thank God for His grace towards us. How can we expect to live life to its fullest if we choose to disconnect from the source of Life? How sad that we so often think we’re better off on our own. Independence can be good for us but not when it separates us from God. Sadly I keep learning this the hard way. It’s time for change in our life and family. It’s time to refocus our attention on the things that matter – on God and His will for our lives. It’s time to leave behind the false safety of our comforts, to stop relying on our own devices and to focus on God and His ultimate, unmeasurable wisdom. It’s time to once again seek God’s forgiveness and surrender our lives, our hopes, dreams and plans for the future to Him. God we choose again to surrender to Your will, to seek Your face and to follow Your ways. Whatever may come we will trust in You for You are faithful. How about you, when have you learnt to trust in God?